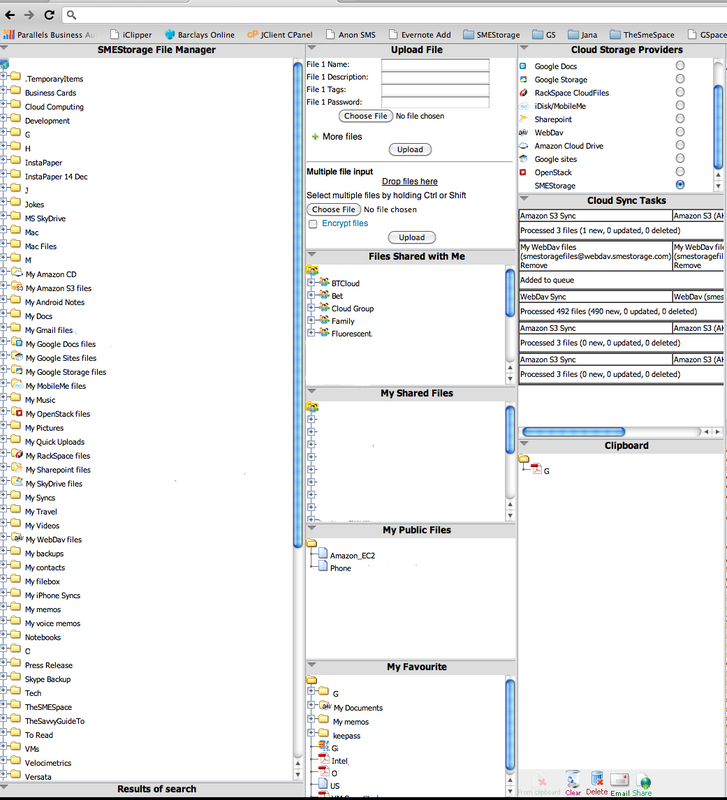 We recently did a roll out of our Cloud File Server service to a company of just under 150 people. The primary driver of this was federating data sources, governance and auditing of data, and the ability to edit files directly on iWork on the iPad. For this use case we’ll concentrate on the latter, enabling ubiquitous document editing on the iPad using the Apple iWork product which encompasses Pages, Keynote and Numbers. The company is a technology company in which different parts of the businesses use different Cloud Services. The core business admin and management uses Office365. Google Docs is used by the sales team, primarily as a way to share Google Docs files easily with their customers and prospects, whom they found to be predominately Google Docs users. DropBox is used by the tech team who like the ability to have replicated to all their code, tech papers etc instantly to any device. Interestingly, whereas you would think this disparate use of similar Cloud storage services is an edge case, we find it is not. The storage vendor names may change, but the disparate number, of what appear to be, similar services remains. One thing this company has jointly bought into was iPad’s. They all used them and their preference was to use Apple iWork as their document editor as they liked it’s simplicity, ease of use, and WYSIWYG features. The problem was it did not work with any of their Cloud products.as it only supported iCloud, MobileMe and WebDav. The company in question had already bought into the SME Cloud File Server. It enabled them to audit files above all the clouds they used and provide Organisation Shared folders that worked above a “set” of Clouds, giving them a single view on disparate resources. As the SME Cloud File Server also supports a WebDav protocol adaptor above any Cloud, something we call CloudDav, then it became very easy for all the teams to create, load, edit, and save documents to either Google Docs, Office365, or DropBox. 3. 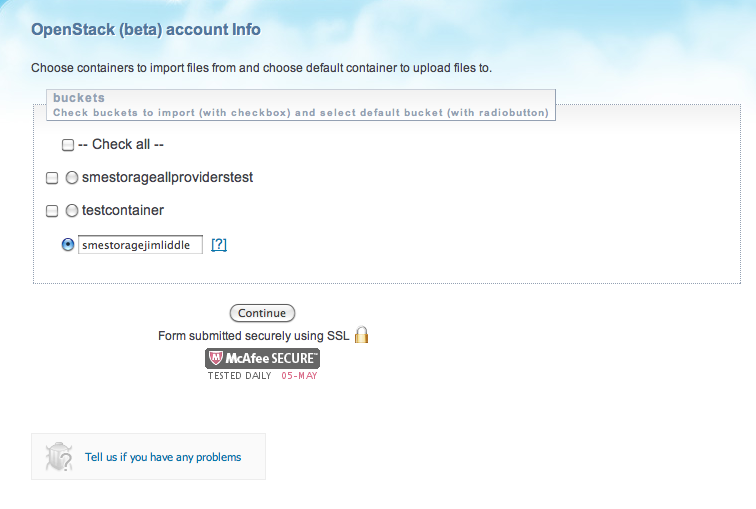 Enter https://Webdav.storagemadeeasy.com as the server address and your smestorage username and password as authentication. 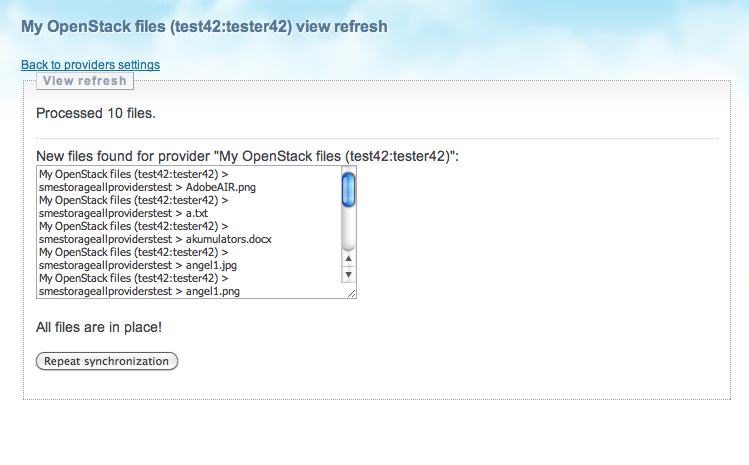 This will then load the file tree and the clouds available to the account. 5. When finished just choose the “Copy to WebDAV” button and it will be saved. 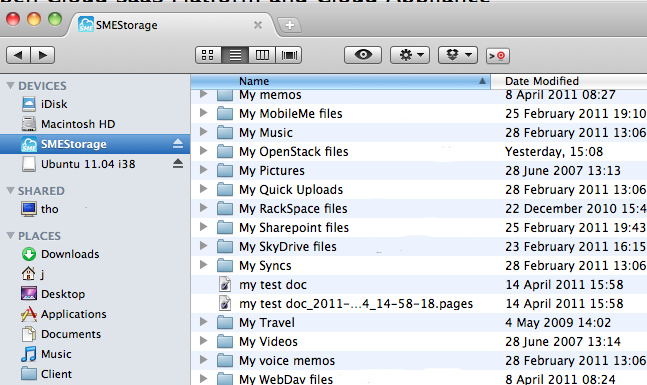 In this way documents in Clouds not supported by iWork can be edited and saved. We’ve enhanced the PogoPlug cloud provider so that as well as supporting PogoPlug appliances, we support also the newly announced PogoPlug Cloud. 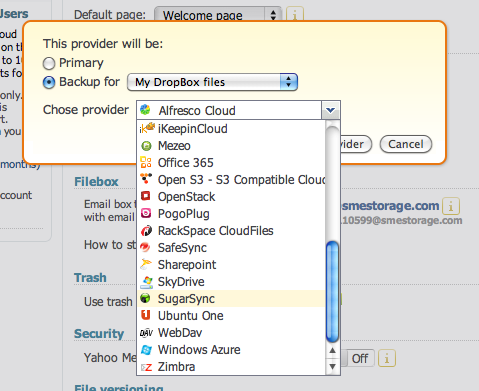 This means that you can use SMEStorage desktop and mobile access clients to manage your PogoPlug Cloud(s) and also business users can use PogoPlug as the data store for a Cloud File Server, and users who want ubiquitous access to PogoPlug from FTP and WebDav can use our CloudDav and CloudFTP protocol adaptors. In the past we have written about Amazon S3 and how, aas the 100 pound gorilla, of the Cloud Storage world, it’s S3 API has become almost a de facto interface for developers. This is one of the reasons that we originally added an S3 API protocol adaptor to our service. Many start up’s, small businesses and even enterprises choose initially to use S3 for storage. This can be fine initially, however, when the volume increases the monthly bill can become an OPEX issue and small companies (and Enterprise) are looking for ways to slash their costs in any way they can. Aside from this other companies have stringent issues about where data is stored (for clarification, Amazon S3 is PCI DSS 2.0 compliant, SAS 70 Type II certified, and VPV ISO 27001 certified) or wish to store it within their own data centre or site. As SMEStorage supports over 35 Clouds and SaaS services, you could very easily turn Google Docs, Box, Windows Azure or DropBox into an S3 Platform, or you could just add your own NetGear or PogoPlug appliance, or other private storage implementation. The SME hosted service, and Cloud Appliance, provides the ability access to any Saas or cloud storage mapped to your account via multiple protocols. These include FTP, WebDav and also S3. These work even if the backend provider does not support the protocol natively. The SME protocol adaptors will do the protocol translation to the native storage provider protocol. 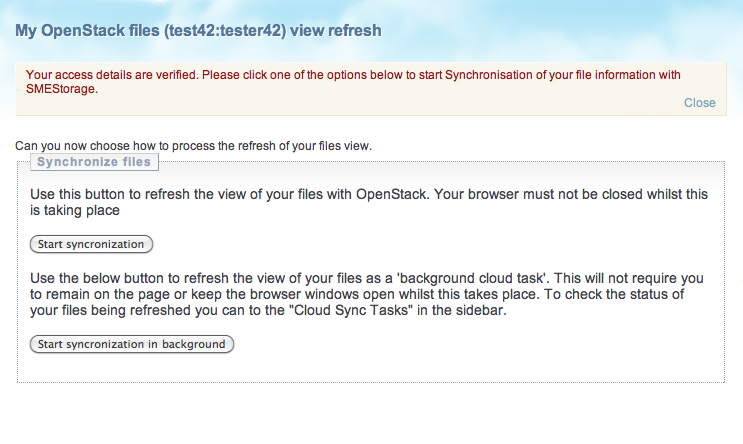 One of the benefits of this that the users don’t need any special software to be able to access the Clouds. They can use any FTP, or WebDav client, or in the case of S3 any S3 client or code in which the host endpoint can be changed. To demonstrate compatibility with the S3 API and tools we will now look at how to use AWS s3curl with a smestorage account. 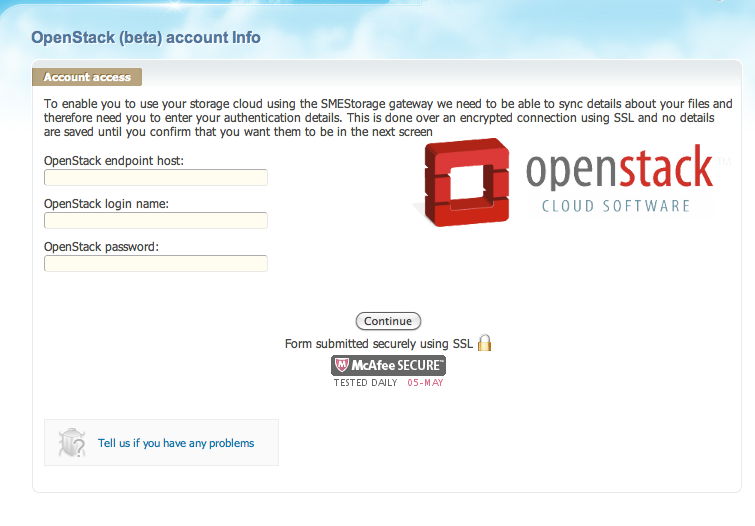 Your id is your smestorage account user name and you can obtain your secret key by logging into SMEStorage.com going to “My Dashboard” (from the sidebar) and copying the API key from the“Tech Info” section where the “API secret Key” resides. For s3curl command line options please see the README file that is part of the s3curl package. Also note that the secure way to use s3curl is to use the .s3curl file in your home directory to pass the id and and key. 1) Quickly allocate cloud-based ‘Private Organization Decentralized Storage’ for clients (‘pods’) that can be shed/discharged with client attrition. 2) Create a seamless management layer between cloud storage asset (pod) and respective client with flexible ACL permissions for individual client access. 3) Provide a branded, feature-rich portal with an improved GUI cloud-management experience for clients to independently manage cloud assets. Why did you choose SMEStorage? #1 BYOD. Whether by Windows, Mac, Android, iPhone, Blackberry, WinPhone, CloudDav, HTTP, FTP, email, fax and web, …you name it, SME’ supports it. 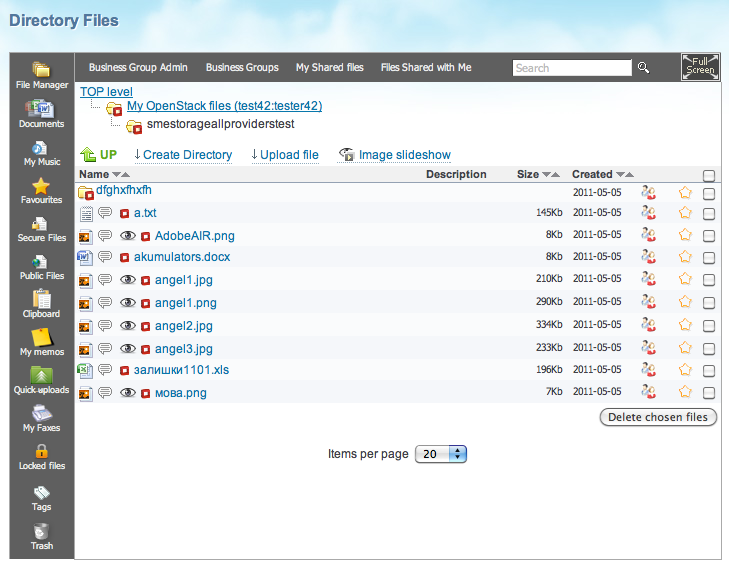 (I wouldn’t be surprised if SME’ announces ‘messenger pigeon-to-cloud’ support coming early Q2 2012 *April fools). Our customers demand access to their cloud on their terms. SME allows us to provide all of this at a fraction of the cost compared to other vendors and with zero infrastructure. #2 Features, features, features …they go on and on and on. They are easy to get to and intuitively laid out. EVERY setting is flexible and customizable. SME’s flexibility allows for limitless applications and ease of management specific to our business’s needs. With ‘power user’ features, we can really manipulate our settings. Nuance matters and we like the flexibility SMEstorage gives us to groom our SME’ service specific to the way we need it to operate. #3 No ‘sky high’ corporate-centric pricing. Fair is fair. No gimmicks. No games. Pay for what you use. A la carte add-ons. We LOVE that. #4 Easy security, backup and redundancy. With SMEstorage, we’re able to isolate our clients’ respective cloud assets as separate ‘pods’ but manage them from a layer above on one interface from within SMEstorage. SMEstorage gives us the ability to import, integrate and transfer assets between virtually EVERY cloud storage provider. #5 Integration, inclusion and extensibility. We can can still access and manage our cloud vendor resources outside of SME’ if we choose to. SME’ provides the flexibility to integrate web storage with our web applications directly with each cloud storage vendor or, alternatively, by proxy with SME’. Often times SME’ provides integration capabilities not available directly from the cloud storage vendor. A good example of one application we use SME’ for is FaithComm’s Cloud Media Storage and CDN. Our client’s’ sites are hosted on FaithComm’s standalone servers while the large media and image files are offloaded to cloud storage ‘pods’ and broadcasted across our CDN. We’re able to manage everything from our SMEstorage account yet each client’s cloud storage assets are independent from each other as separate S3, Azure, Rackspace, etc. accounts. From the client’s point of view, the two applications are seamless. Additionally, we provide each client with group ACL login credentials to collaborate on, access, combine, transfer and manage all of their their cloud storage assets via SME’ on the device of their choice. SMEstorage, in our opinion, is a brilliant development in the storage and management of cloud-based assets. The SMEStorage implementation of CloudDav enables us to provide WebDav over any Cloud whether the underlying Cloud supports it or not. This has great use on devices such as the iPad when users want to use Google Docs with iWork or SKyDrive with iWork etc. 1. Whenever SMEStorage changes a file (if file versioning is not turned on) then the original file is actually versioned and moved to Trash. The file is not actually removed from the underlying Cloud until the Trash is emptied and is visible in the same directory as the newly created file, except it has a date and timestamp appended to it. 2. iWork actually creates an empty file when you are working with the file you wish to edit. This file is empty and is a lock on a file that it lets go of once the file has been saved, but it results in the creation of a real empty file. 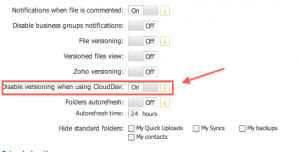 Most of our users who use CloudDav with iWork just want one file that they changed to be saved and no additional files which they have to manually remove. This option is on for all new CloudDav accounts and can be turned on for any existing CloudDav accounts. This will prevent the creation of the extra two files in iWork on the iPad / iPhone. 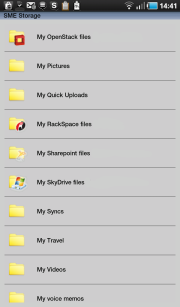 The latest version of the iSMEStorage Cloud File Manager for iPhone / iPad is now in the App Store. There are a host of new features including a re-designed workflow for easier Cloud Files (and local flies) interactions, a new PDF component that supports large PDF files, and support for OpenStack and Google Sites Clouds. We are really pleased to announce that we have added OpenStack Swift object Storage support to the SME Open Cloud Platform. Swift is a sub project of OpenStack and provides a highly scalable redundant unstructured data store. Swift is 5 separate services, object, container, account, auth and proxy. Although each of these can be scaled separately, in practice they run together. 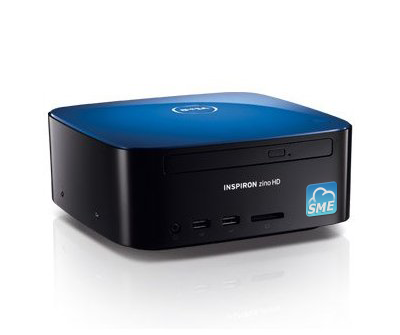 From our perspective we have seen ISP’s and larger SMB users of our on-premise Cloud Gateway appliance expressing interest in SME supporting this, and we supply this as VMWARE Appliance (OR XEN, KVM) or as a dedicated hardware appliance for smaller companies who wish to embrace their own private Cloud infrastructure. As with our S3 API endpoint support SME will overlay a more traditional file store on top of Swift layered with the business functionality we provide in our Cloud File Server, which includes virtual drives and clients for Mac, Windows and Linux, and feature rich mobile clients for iPad, iPhone, Android and BlackBerry, as well as value added features to Swift such as Webdav and FTP support. When entering the endpoint URL you should be sure to include the Port. An example URL is: http://<IP Address>:11000/v1.0. Next you will need to choose which containers you want to work with and which should be the default container for any uploads to smart folders. Once you have done this you will be ready to start the meta-sync which pulls in and caches all the information about containers and files. 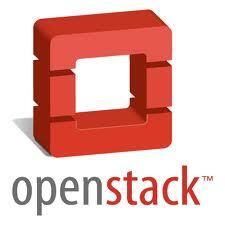 If you have any issues connecting please refer to this advanced post on using SME with OpenStack 1.60 and SWAuth. Once complete you will be able to access/amange your OpenStack files from the SME Web clients, as well as using a Cloud Drive on Windows, Mac or Linux, and mobile clients for Android, iOS, and BlackBerry, and the plethora of other tools and clients that SME provides. We’v e posted some screenshots below of this.